Fixing my headband in the ornate mirror as I waited for the lift, I realised how at home my silver flapper outfit looked in the reflected surroundings. Not only was I spending the night in the grand and eloquent Old Swan Hotel in central Harrogate, but I was about to be a guest at one of the establishment’s monthly murder mystery events – quite fitting for a place so lovingly affiliated with crime writer Agatha Christie, whom secretly fled there for ten days in 1926, provoking the largest manhunt of the time. Hosted by the Murder Experts – one of the most successful and rapidly growing UK murder mystery companies in the UK – our theme for the evening was ‘The Crash’: a 1920s era fine dining experience with a deadly twist. Nine professional and semi-professional thespians made up the cast of Grimshaw’s Textiles Ltd., a booming textile company about to be treated to a dinner by their MD, the work-obsessed Mr Harry Grimshaw, in honour of his Bank Manager. All is going well for the characters as they mingle in the cocktail lounge with Harry’s 94 other guests – all patrons such as myself, mostly in fancy dress – but not long into our being seated in the impressive Wedgwood Suite, a terrible muuur-der is revealed and the night takes a fatal turn. Throughout the flow of a delicious four-course meal, the actors not only displayed theatrical scenes to the whole room, but also mingled with us individually, dropping subtle hints and answering our questions as we tried to figure out who the murderer could be. An investigator spearheaded the action, which further unravelled throughout the evening with the help of several evidence boards and the approachable cast dining alongside us. 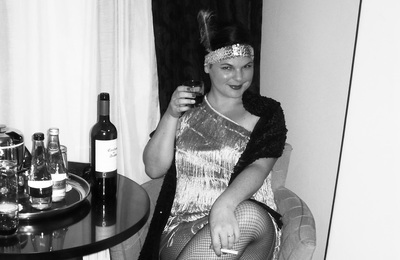 The plot contained enough twists and turns for my guest and I to change our answers a few times and then – with another, more visible murder along the way – we had a ‘stab’ at our final answer, although there were a few motives to choose from. To our satisfaction, when the culprit was dramatically unveiled, it wasn’t the person we’d been thinking, but it was an obvious choice and fitting to the plot. 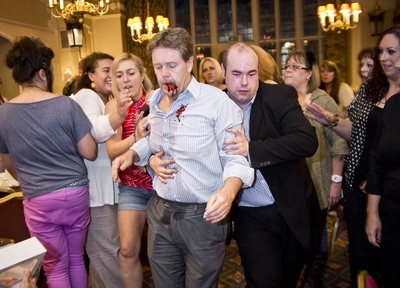 Murder Experts put on a range of their 130 professionally-scripted themed plots at venues throughout the UK all year around, even branching into cruises next year, but with the Old Swan’s history, elegance, classy staff, comfortable rooms and great food, their monthly couplings are in particular a match made in heaven. Talking to David Rose, AKA Harry Grimshaw, after the event, he told us, ‘I’ve been acting with the company for seven-years and I love it. No two evenings are the same and it’s the audience participation that makes it.’ I must admit that sharing good food and wine with this murderous happy family and its fun-loving audience is a great way to spend a night, and I for one will be back… after all, whether as a quirky date night or with a group of friends, family or workmates, it’s a real fun way to flex those ‘little grey cells’. Murder mystery evenings, including a four-course meal, start from £43 per person, and all‐inclusive murder mystery weekends from £199 per person. 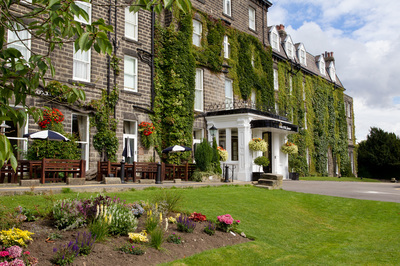 See www.murderexperts.com or www.classiclodges.co.uk/The_Old_Swan_Hotel_Harrogate for more information.